We manufacture, export and supply ultra modern Hydraulic Manual Stacker. The Hydraulic Manual Stacker, supplied by us is known for its robust make and excellent performance. 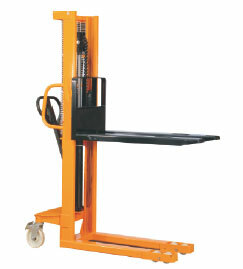 This Hydraulic Manual Stacker can be availed from us at the market leading price. The standard machine is available up to a lift height of 1600mm. An option up to 4200 mm is also available.